There was a hard shower during the night. And now, the sun is up but not out. 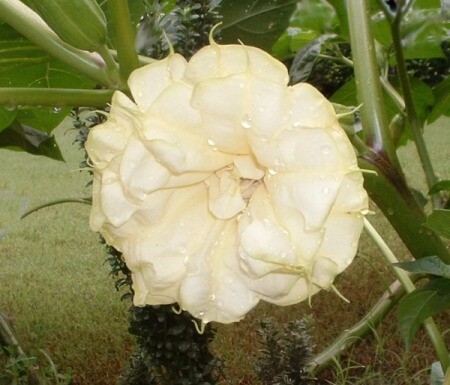 No matter, Mr. Datura metel 'Triple Yellow', though still sporting a few rain drops, radiates his own bit of sunshine. Years ago, I learned an old saying. 'On gloomy days, carry your own sunshine around with you'. Some people have the ability to do just that....and it's such a pleasure to be in their company.